IDSync® provides complete integration with Autotask for both Managed Service Providers (MSPs), Consulting Firms, and their End-Customers. Whether you’re an MSP, or IT Consulting company looking to integrate your Autotask Resources with Active Directory, looking to integrate your customer’s Active Directory into your Autotask CRM system, or looking to integrate Active Directory with Customer Portal or Autotask TaskFire, IDSync® provides complete two-way identity federation and integration for the Autotask platform. When using Autotask, management are faced with a challenge of on-boarding employees and clients with many users. Each of these users and their contact information must be entered into the Autotask CRM system. Once they are in operations, they are challenged with maintaining the accuracy of contact information used for CRM, Help Tickets and other marketing and communications purposes. Once a contact is added, the Autotask administrator can choose to provide them with access to their projects and tickets within the Autotask system via the Client Portal or Taskfire. Enabling either of these features requires the administrator to setup a User ID and password for the contact and maintain this information on an ongoing basis. IDSync® eliminates all these manual chores of maintaining the accuracy of your Autotask contact data, the heart of your system. With IDSync® — the MSP can automatically provision the client and all of their users. By utilizing IDSync® support for Windows Security Groups, the MSP can create a security group and automatically provision all of the user accounts just by adding them to that security group. If a group of user’s needs the Client Portal or Taskfire that is simple too. Just create a Windows Security Group for Client Access or Taskfire access, set the permissions the way you want it to be, and add the users into that group. Not only will IDSync® provision the user for Client Access or Taskfire, but it will also synchronize their Active Directory password to minimize management and support issues. IDSync® supports two-way integration with Autotask. 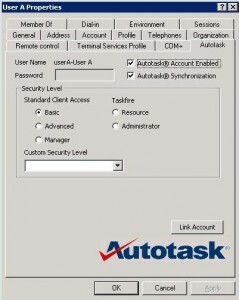 This means that, if enabled, any updates you make within Autotask to a user’s name, address, e-mail, and other contact or configuration information is automatically synchronized back to Active Directory saving you the time and effort of having to log into your customer’s environment to make the changes in multiple places. Further, if other IDSync® Connectors are used (Hosted Exchange, SharePoint, Odin Automation, IBM iSeries, Ingram Marketplace, etc…) these user information changes, made within Autotask, are automatically synchronized to all of our connected applications. This keeps your Autotask CRM contacts database 100% up-to-date while automatically updating the client site at the same time. Ask about our other connector for Autotask, the Ingram Micro Marketplace connector to simplify your billing.